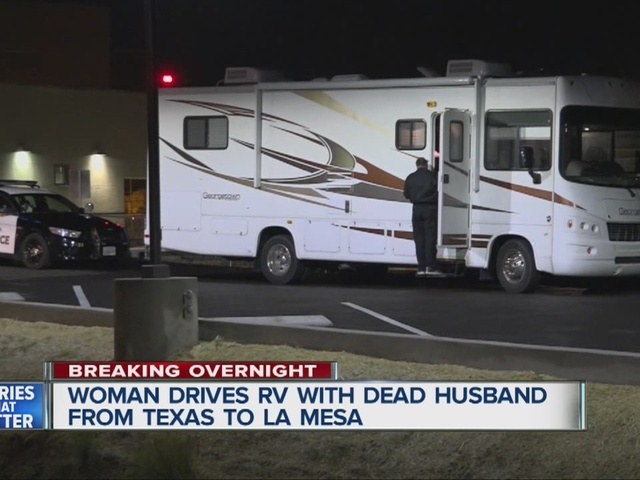 SAN DIEGO – An elderly east San Diego County woman made the 23-hour drive from Texas to San Diego with the body of her dead husband in their RV. The woman arrived at Sharp Grossmont Hospital early Monday morning after driving straight from Houston, Texas. According to La Mesa police, her 80-year-old husband was hospitalized in Houston with a stroke a few days ago. He was released from the hospital and asked not to be resuscitated. The woman began to drive back to San Diego County, and her husband reportedly died at some point while they were on the road. Police said that on her drive, she even called a local mortuary, but they told her she would need a death certificate, so she decided to pull into Sharp Grossmont when she arrived. Police say the woman, who was not immediately identified, did nothing illegal and will not face charges.